Note: The story below is written by a leader in one of the General Commission on Archives and History's most important ventures---The Committee for the Study of the Hispanic/Latino United Methodist Church. Dr. David Maldonado (with Bishop Joel Martinez) was the recipient of GCAH's Distinguished Service Award for 2018, honored for gathering, promoting and interpreting the stories of Hispanic/Latino Church within the historic Methodist and United Methodist traditions. There is no more timely, poignant and pertinent story for one to reflect upon as this past Christmas becomes a memory. As you lovingly box and stow away your nativity set for another year, please keep this story and scene (above) in mind. 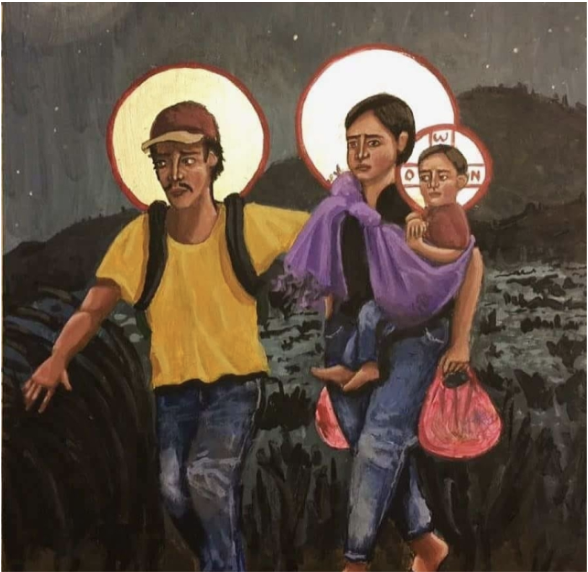 by Dr. David Maldonado, Jr.
And so the child is born in a new land, a child born of humble immigrants who seek nothing more than life and hope for tomorrow. The young couple grabbed what they could carry with them and set out in the dark night. They were leaving familiar surroundings, as well as their home, friends, and family. They were expecting their first born and wished the child could be born at home surrounded by their community. But for the sake of the child, the young couple knew they must leave, so they walked out into the cold and dangerous desert night. It was a huge risk for them to leave, but it was also a leap of faith and hope that the land to which they were going would be a life-saving and life-sustaining place. As they made their way through the darkness, guided only by a sea of brilliant stars, they wondered what their future held for them and their child. It was their hope for the child that kept them focused and determined on their trek. They were afraid. Robbers were known to attack travelers in the night and in the desert. What if they were caught in the night? Would they be arrested and treated as common criminals? Would they be sent back to their homeland? Fears have a way of immobilizing some people. But for this young expectant couple, fear drove them even deeper into the night. What they feared the most would be life without hope, life without a future for their new family. In their whispers they encouraged each other and prayed that their child be born in the new land of hope. They had to arrive in their new land before day broke. But that was not to be. The child could no longer wait to be born. They were now well into their new land. They knew no one here and their surroundings looked strange and foreign. Where could they go for the birth of their child? Who would welcome them and offer hospitality? They knocked on the first door that they saw. The lights were on and the house looked welcoming. They saw the curtains move and a face peeked out to see who was knocking on the door. But the door did not open. From outside the house, they heard the voice of a woman inside. "Who is it?" she asked in a whisper. A male voice from within the house responded in a loud irritated voice as if wanting to be heard by the travelers standing outside the door. "Oh, nobody, just some foreigners probably looking for a handout," responded the male voice, adding, "they should go back to where they came from." The young couple, hearing the voices, covered their heads and kept going. They were determined to survive. They came to yet another house with its lights still on. "Maybe they will be more welcoming," cried the young pregnant woman. This time, the door opened slightly. "Who are you? What do you want? Where are you from?" the voice called from within the slightly opened door. "We just arrived and our child is ready to be born," responded the young father-to-be. "We are not from here. We are not asking for charity. All we need is for our child to be born safely. I am willing to work to repay you for your kindness." "Humph! Some more of them. They just cause problems for the rest of us. I wish they would stop coming. I wish they would just leave. Our whole town is changing because of them, but I could sure use his cheap labor in the morning. They are good workers. Hope nobody is looking," thought the man from behind the door. With a suspicious glare, the man yelled out, "OK, you can stay in the back, but don't make trouble or we will call the police on you and send you back where you came from." And so the child is born in a new land, a child born of humble immigrants who seek nothing more than life and hope for tomorrow. A child is born in a new land and there is life and hope for a family. Many of us know this as the story of the birth of Jesus. It is also the story of the birth of the child of the immigrant today. It is the story of hope. call us to remember all who need your sustaining love. in the coming of Jesus Christ. GCAH is proud to be one of the Pilgrimage sponsors now under the direction of The Upper Room. The deadline to register is January 30, 2019. The special issue due out late-January will feature the plenary papers from the convocation. A limited number of copies will be made available for purchase by non-subscribers at $15 plus shipping. Send requests to mmerkel@gcah.org. If you are 70 ½ or older you may be eligible for an additional tax benefit known as IRA Qualified Charitable Distribution (QCD). You and your spouse, if filing a joint tax return, may each give up to $100,000 per year. Any QCD amount give to a qualified church or non-profit from your IRA is not included as taxable income on your federal tax returns. Please note that your contribution must be a direct transfer from your IRA in order to qualify. Persons beyond 70 ½ must take an annual Required Minimum Distribution from their IRAs. To take advantage of this benefit and give to GCAH, please contact Fred Day at atday@gcah.org. In 1958, the Television, Radio and Film Commission of the Methodist Church (TRAFCO) launched an ambitious television series: TALK BACK. It was a public service program dealing with a variety of social and cultural issues of the day. A 15-minute drama raised-up these pressing issues and was professionally produced in a studio built by TRAFCO. You'll recognize many of the actors from other vintage TV shows. The second half of the program was a panel discussion including religious and community leaders responding to the issue at hand from various points of view. The program did not end with a resolution, but rather an invitation to the viewing audience to continue the discussion. TRAFCO produced 26 programs in the year-long series. Topics included theft, lying, guilt, ageism, class distinctions, God's will, dealing with immigrants and race relations. GCAH has digitized these programs and they are available in the UM Historical Media Project of our archives. Enjoy this look back at the ways our church dealt with social issues 60 years ago! This year's GCAH Heritage Sunday theme, "Bold Faith, Audacious Women" highlights the 150th anniversary of United Methodist Women. The date for Heritage Sunday 2019 is May 19. Resources to enhance your local celebration will be available beginning mid-March. Mark your calendars now!